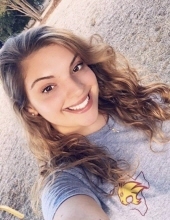 A Rosary is scheduled for 7 p.m. Friday at Thomason Funeral Home in San Marcos; visitation will be from 5 to 7 p.m., and following the Rosary. Her friends held a vigil for her Thursday evening. A single mother, Annie was devoted to her 6-year-old son, Jase, and loved nothing more than playing with him and watching him grow up. She was enormously proud last fall when it became apparent Jase was picking up how to read so quickly. They loved to go to the park, wrestle, take selfies and sing together. He was her shining light. Annie often would say that there was nothing more important than family. Her love for them was deep and unconditional. Annie loved holidays because those times drew her family together. She enjoyed gathering around the dinner table as everyone told stories or played games. A wonderful listener, Annie gave great advice as a loyal friend to so many, and always saw the best in people. Annie appreciated animals, especially dogs and cardinals, and enjoyed spending time outside. Her true nature included sensitivity and thoughtfulness, though she sometimes only let people see her tough exterior. Annie took her life Monday evening after suffering from bipolar disease since her pre-teen years. Her mental illness, a brain disorder that’s often misunderstood and always comes with a stigma, stole her childhood. Despite this, Annie strove to find peace in her days and nights. Much of that came with the joy she felt raising Jase. Annie, a rare and kind human being, will be missed beyond belief by her son, parents, brothers, other family members and friends. She was preceded in death by her grandparents, Jim and Diane Brown of San Marcos; an aunt, Ann Brown; and uncle, David Tisch Jr.
She is survived by her 6-year-old son, Jase; parents, Tom and Susan Brown of San Marcos; brothers, Thomas, Jake and JD Brown of San Marcos; grandparents David and Judy Tisch of Golden, Colo.; aunts, Shawn Troxell, Mary Brown, Kelly Brown, Julie Brown, Jennifer Tisch, Debbie Tisch, Elizabeth Sherman and Carmen Goodwin; uncles, Jim Brown, Mike Reilly, Rick Tisch, Paul Tisch, John Sherman, Jeff Goodwin and Dave Troxell; and 16 loving cousins: Ryan, Bryan, Jessica, Joseph, Avery, Lauren, Bradley, Savannah, Julia, Matthew, Mark, PJ, Emma, Jeffrey, Angel and Gabe. An education savings account for the benefit of Jase Brown is at Schertz Bank and Trust, 2202 Hunter Road, San Marcos, Texas 78666; please contact Gigi Gutierrez at the bank for information on how to contribute. The number is 512-754-7401. To plant a tree in memory of Ann Marie Brown, please visit our Tribute Store. "Email Address" would like to share the life celebration of Ann Marie Brown. Click on the "link" to go to share a favorite memory or leave a condolence message for the family.